Using a guillotine cutter, it’s a quick motion to close the blades – and easily cut your cigar. 3. Cut just before the cap leaving 3-4 mm to avoid tearing the wrapper. (Tip: On figurados, just cut off enough so you can see the filler.) To get the best results, try cutting in one quick, strong movement. 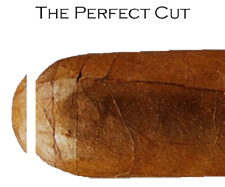 If you are using a bullet punch cutter, all you need to do is insert the punch on the head of the cigar to cleanly cut a small hole. If you prefer lots of smoke, you just need to insert the punch several times at slightly different places of the cap to cut a bigger hole. You can conveniently carry your bullet punch cutter around using the key ring attachment, but, alas, you cannot use this type of cutter on Figurado shapes.